(Newser) – A former aide to Gov. 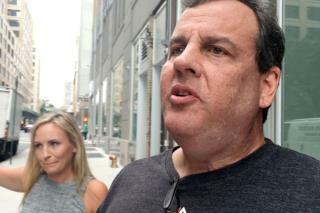 Chris Christie texted to a colleague during a news conference about the George Washington Bridge lane-closing scandal that Christie "flat out lied" about the involvement of his senior staff and campaign manager, according to a new court filing. The AP reports a transcript of the text is contained in court filings submitted late Tuesday by attorneys representing Bill Baroni, who faces trial next month with Christie's ex-deputy chief of staff on charges they helped orchestrate the September 2013 lane closures. The closures were meant to create traffic jams in the city of Fort Lee to punish its Democratic mayor for not endorsing the Republican governor, prosecutors say. This is nothing new, I am not outraged. But, dam? You finn politicians. The real reason he shut down the bridge was so no one but him could get to the donut shop. Of course he was / is lying about it. Everyone knew that the day the story broke. Also there is no doubt that he ordered the dirty deed himself. But realistically, he is wise to continue to deny the whole can of worms. He would have charges filed against him toot sweet. It would be a big fat mess for him to pay for.